For those who don’t know, code camp oz is a yearly event run in Wagga Wagga (since it is directly between Melbourne & Sydney so no one can complain), it is run by people in the community. Last year’s conference was my first and it was a blast. Hope some of you can make it along so you can see the presentation, or course I’ll upload all of the materials after code camp. A bunch of new videos have been uploaded to MSDN to help demonstrate a lot of the fundamentals of Windows Azure. At the time of writing there is also an additional video you can get by going directly to the RSS feed. Hope you all learn something new! A short while ago, Damian Edwards released Visual Studio 2008 XHTML 1.1 templates on CodePlex that gave you a “set of item and project templates for ASP.NET developers using Visual Studio 2008 that provide XHTML 1.1 compliant alternatives to the standard web form and master page templates”. This is a great starting point to ensure that your new websites start off on the right foot by providing a set of files (web forms, master page, stylesheets, etc.) that are preconfigured to be XHTML 1.1 strict compliant. 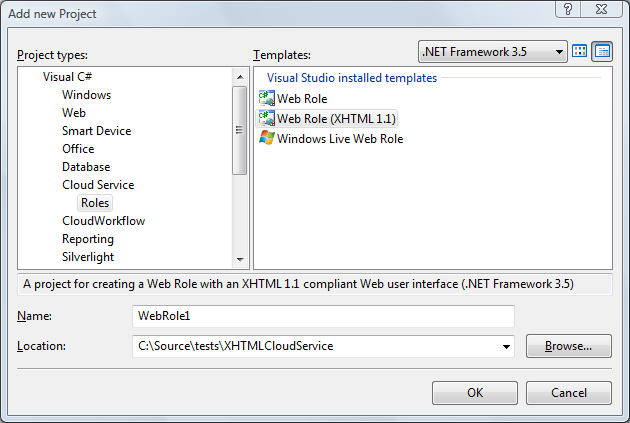 I decided that since this is such a great thing that I’d re-release the template as a Windows Azure Web Role, meaning that you can all create new cloud services that start off as being XHTML 1.1 compliant. I didn’t mess about creating a fancy installer, so you’ll have to do 2 things. The “Add a new project” window will appear and the new Web Role (XHTML 1.1) template should be there ready to use! David Aiken just announced that they have released the latest revision of their Azure training kit. If you are getting started with Azure then this is definitely what you’ll want to download to help you get started with it. Silverlight on iPhone a possibility? Update: There is an article here with more information, although the title of it is misleading since the content contradicts its own title.